This easy fried rice recipe tastes like something you’d get at a Chinese restaurant. Fried rice is a great side-dish! Add some protein like beef or chicken and you have a quick and easy dinner. During the hectic holiday season, it’s so easy to fall into the trap of eating out. While this not only doesn’t help your waistline, it can also kill your holiday budget. Instead, make your favorite comfort dishes that you get for take out at home. One of our favorite take outs is Chinese food. Everyone has their favorite but we always order a large portion of Fried Rice. Fried Rice is super easy to make at home and can be thrown together in about 15 minutes. Get my favorite cooking products for making easy fried rice on Amazon! Buy them TODAY so you can make this easy fried rice this week! There are some tricks when making this easy fried rice at home that I have learned through trial and error. #1 You gotta use butter. Skip vegetable oil and margarine. You gotta go with the real deal to get your rice to fry nicely. If you ever had dinner at a traditional hibachi restaurant, you know how much butter goes into making fried rice. Don’t skimp! #2 Use cold, brown rice. For me, brown rice is the perfect rice to use for this easy fried rice recipe. You want your rice to be a little sticky and chewy and brown rice fits the bill. Or if you have leftover white rice, that works too! #3 Be patient. While you may feel like it’s taking a while to cook, you really want to make sure you give your rice even time to fry. Sauteing the rice with the veggies helps to pull all the ingredients together for that classic “fried” flavor. You also need the right tools! You don’t need a wok to make Fried Rice. I have the Cuisinart Everyday Pan and it works just as well. I basically use it every day…gee I wonder how they go the name! Also I really love cooking with Bamboo Utensils. 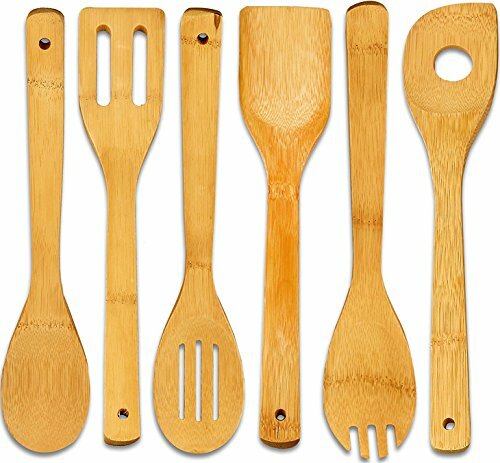 I have quickly replaced almost all of my cooking utensils to bamboo. If you want to add protein, feel free to add chicken, pork, steak, or shrimp but this fried rice really doesn’t need it! Heat 1/2 tablespoon of butter in a large skillet over medium-high heat until melted. Add egg, and cook until scrambled, stirring occasionally. Remove egg. Add an additional 1 tablespoon butter to the pan and heat until melted. Add carrots, onion, peas and garlic, and season with a generous pinch of salt and pepper. Saute for about 5 minutes or until the onion and carrots are soft. Increase heat to high, add in the remaining 1 1/2 tablespoons of butter, and stir until melted. Immediately add the rice, green onions, and soy sauce. Stir until combined. Continue stirring for an additional 3 minutes to fry the rice. Then add in the eggs and stir to combine. Add the sesame oil, stir to combine, and remove from heat.